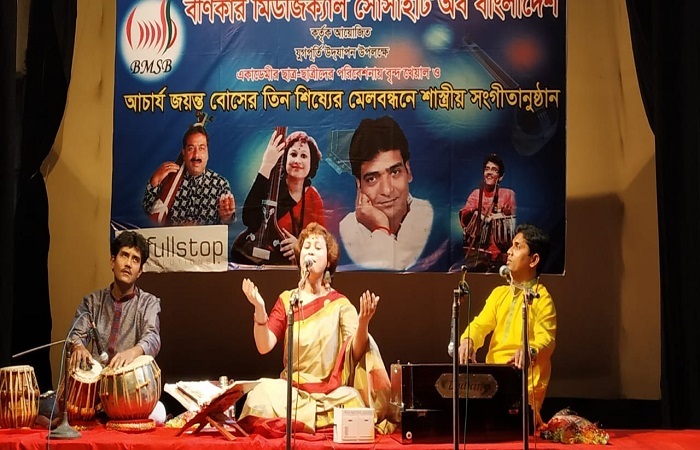 The two-day long music workshop has been held in the National Nrityakala Academy auditorium of Jatiya Shilpakala Academy as part of Beenkar Musical Society of Bangladesh. on the last day of the workshop, first two days of the ceremony, music workshop was organized and In the concluding ceremonony of the workshop, the students of Vandekhal and Acharya Jayant Bose (Pandit Niladri Nath, Kheli Pankaj Basu and Shrimati Patanjali Chattaji) performed classical music with the performance of the students of the Music Society. Pundit Niladri Nath and Indian filmmaker Sravolanath Knotar were present at the workshop as instructors. Even on the last day of the workshop, a non-literate classical and sub-classical music evening was performed in Jatiya Sangeet auditorium. Pundit Niladri Nath (India) and Kheali Pankaj Basu, the two disciples of Acharya Jayant Bose, performed dual Kheyal in the third phase. The audience of the two voices became fascinated by the artwork and extraordinary singing of these voices. Along with this, Ganaka Tan and Chhatat Tan and Saragama enchanted everyone. At the end of the ceremony, Shrimati Dhranti Chatterjee (Mahantarashtra, Poona) performed the sub-classical, thumri, ghazal, Dadra, Chaiti, Hori and Kashri. The audience was enchanted with his extravagant voice. Prominent cultural personality Kamal Lohani was present as the chief guest at the program. Sohrab Uddin, the Director of the Music and Dance Department of Shilpakala Academy, former joint secretary and adviser (RNPCBL) and cultural patron Rabindranath Roy and noted dramatist Shankar Sautal Chowdhury were also present as the special guests at the function.